In November 2012 Poland’s Constitutional Court held that the religious slaughter of animals for Muslims and Jews violated the country’s constitution and animal welfare laws. The European Union rule that went in to effect on January 1st allows an exception for religious slaughter. With the E.U.’s exception to the rule that all animals be stunned prior to slaughter, Poland’s court ruling has now been in conflict with the exception. This past July Poland’s lawmakers introduced a law to allow an exception for religious slaughter but it was then voted down. Leaders of the Jewish and Muslim faiths are concerned that Poland’s refusal to allow a ritual exception will limit their right to religious freedom. Both groups are now requesting the Polish court to examine the law again. 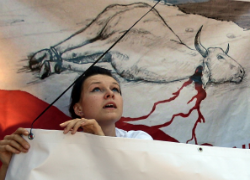 A woman in Poland protests ritual slaughter for kosher and halal meat. Humane laws aim to reduce animal suffering by requiring that animals be stunned prior to killing but the traditional customs of Jews and Muslims follow a different method. Livestock animals are killed by slitting the throat and allowing it to bleed out while still conscious. Religious leaders argue that their practice has been used for thousands of years and it is consistent with humane treatment of animals because they require the animals to be healthy and uninjured prior to death. They do not believe in treating the animals in a cruel manner and argue that their method of slaughter delivers a quick death. The research provides conflicting views. A study from University of Hannover in Germany suggests that with the ritual slaughter properly performed, after the first three seconds the animal will fall into a deep sleep-like consciousness due to the loss of large amounts of blood, which cuts off oxygen to the brain. On the other hand, a 2009 study from New Zealand’s Massey University claimed that although a calve loses consciousness after several seconds pass, the pain sensations will continue for up to two minutes. That study then applied the stun method and claimed the pain on the electroencephalography ceased immediately. Although the majority of Polish people are Catholic, democratic ideals urge the rights of religious freedom should be protected for all of the various groups of faith. Recently, Pope Francis has expressed his concerns and opposition to restricting religious freedoms and has ordered an investigation in to Poland’s ritual slaughter ban. On the other hand, Terry Sanderson of the National Secular Society, believes the Pope’s actions will “interfere with the democratic processes of an independent nation like Poland.” He argues that an attempt to overturn parliamentary or judicial decisions threatens democracy and would be an abuse of the Catholic Church’s power. The Vatican announced that there will be a follow-up meeting after the investigation conducted by Cardinal Kurt Koch is complete. The loss of ritual slaughter not only raises concerns for religious freedoms but also increases economic and financial troubles for Poland’s citizens. Ten percent of the cows and chickens are slaughtered by kosher and halal methods and those slaughterhouses employ 4,000 people. Poland subsequently exports that meat to twenty different countries. Last year commercial butchers exported $460 million worth of kosher and halal meat. In preparation for Jewish New Year, Rosh Hashanah, kosher meat was imported from Vienna and Budapest, although some slaughterhouses in Poland are continuing their traditions and ignoring the ban. Other countries that ban ritual slaughter include Sweden, Norway, Iceland, Switzerland, and Latvia. The Dutch government also introduced a ban but it was later abandoned and the community instead reached a compromise on the length of time the animal could be conscious. When the Polish court revisits this issue it will look to clarify the factors weighing on the matter. The court will need to consider the religious rights of Jews and Muslims, the rights of the animals under their animal welfare regulations, the EU law, the Constitution of Poland, and the religious and economic implications of allowing or banning the exception to ritual slaughters. The pressure of these numerous factors may lead the government to seek a compromise in Poland, similar to that used by the Dutch.